My friend Maria has a little boy that likes to sleep with an eye mask. Sleeping masks usually tend to be a little girly, so for his birthday she asked me to make him a green lantern sleeping mask. I lined it with gray satin for extra comfort. What a great way to make falling to sleep fun. I think this would also be fun for a superhero party where you need to use a blindfold for a game. I'm even tempted to try sewing one up and cutting out the eye holes for a Halloween mask. 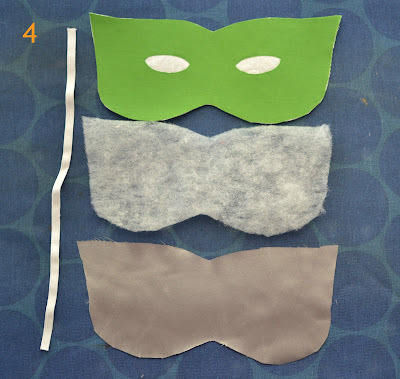 These masks are so easy to make I decided to make one for my little boy as well and I took a few pictures of the process while I made it, in case you want to make one too. I even made a little template. You'll need fusible web, a scrap of green fabric, satin or other backing fabric, 1/4 inch batting, 1/4 inch elastic, Fray Check, and thread. 2. Peel away paper making sure the web stays on the fabric. Now you have an iron patch. 3. 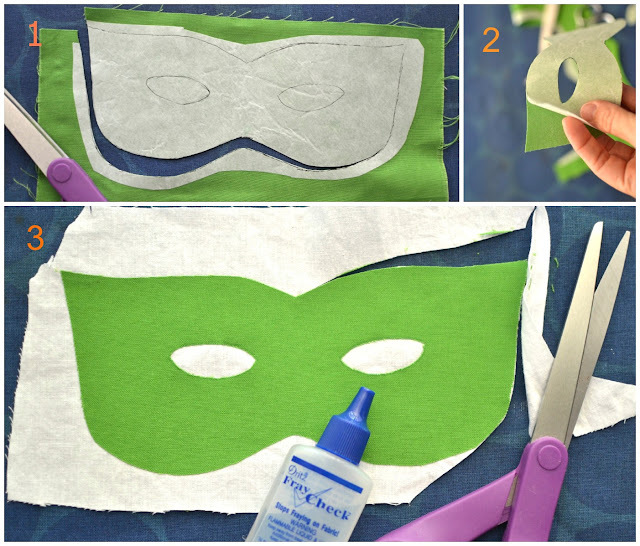 Iron your mask onto white fabric and cut out the mask again. Put a thin line of Fray Check on the edges of the eye holes. This is will seal the edge so it won't fray. 4. Cut out your batting and satin pieces. Cut 10 inches of elastic. 5. Attach the elastic to the sides of the green mask with a basting stitch. Make a little sandwich by stacking up the batting, green mask face up, and satin shiny side down. Pin around the sides. 6. 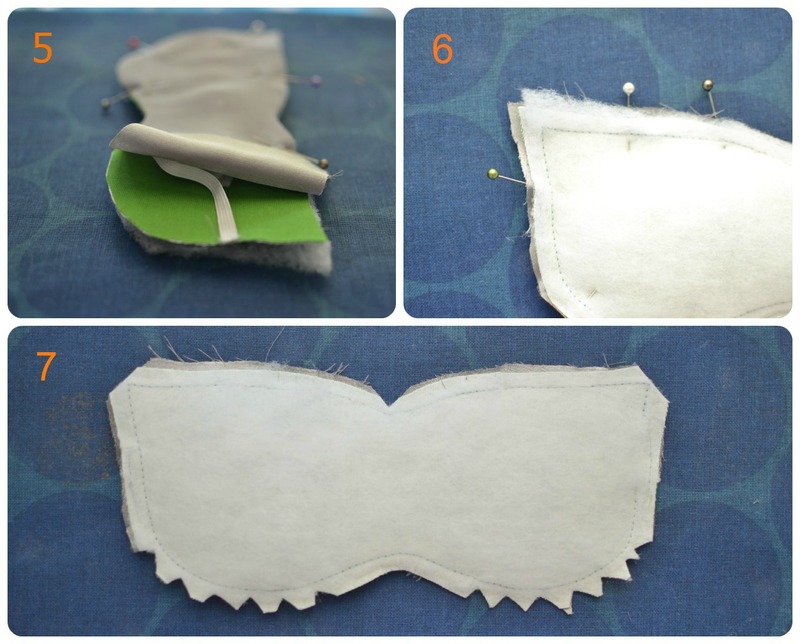 Flip the sandwich over and stitch around the mask a little less than 1/4 inch away from edge of the white fabric. This sating slips around a bit. 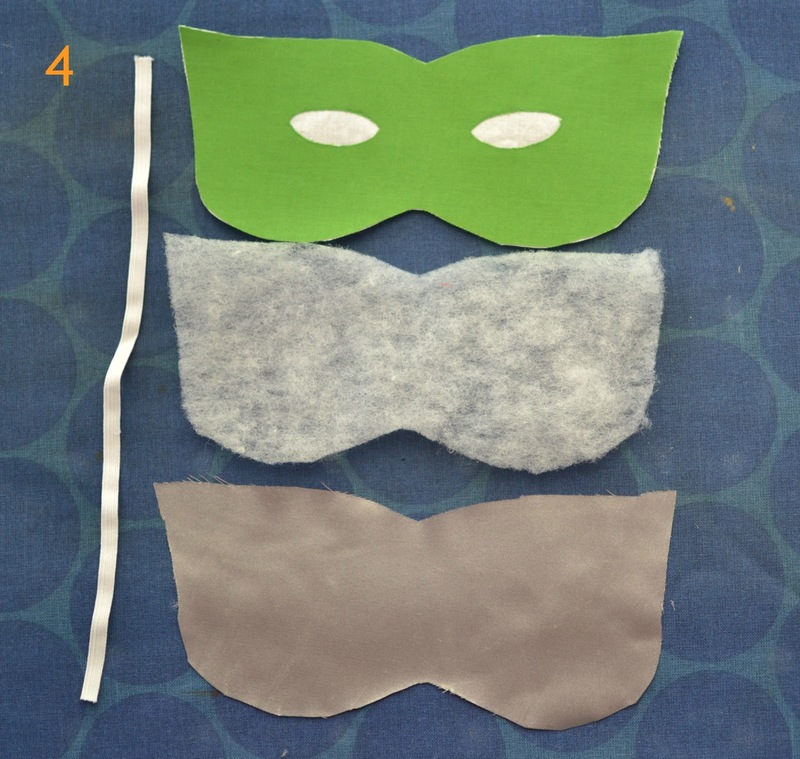 If you use the white edge as your guide the mask will turn out the shape you want it. Leave about a 1 inch opening on one side. 7. Trim the batting away from the seam and clip the corners and curves. 8. Turn the mask inside out. Pulling on the elastic makes it easier. Use a blunt tool to push out all the curves and corners. 9. Press edges flat. Tuck in the raw edges on the opening to match the other edges and press. 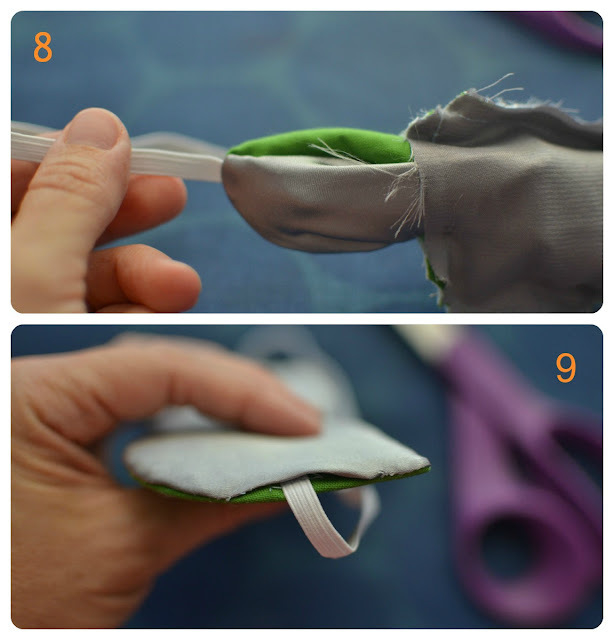 You can use a needle and thread to close the hole or it will just get stitched closed when you sew around the outside. Lastly, topstitch around the mask about 1/8 inch from the edge. Stitch the nose wrinkles if you'd like also.